This sweater will be the last of my winter sewing. 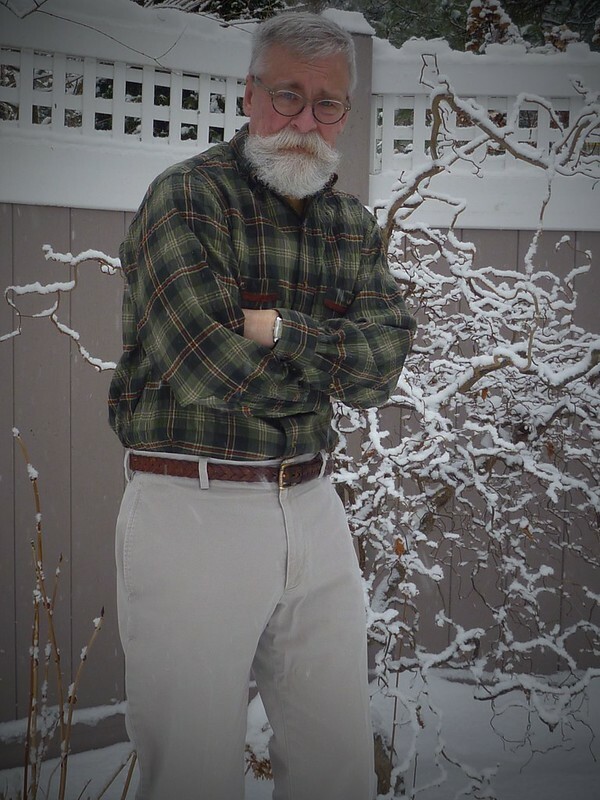 Like many of you, I'm ready for spring. 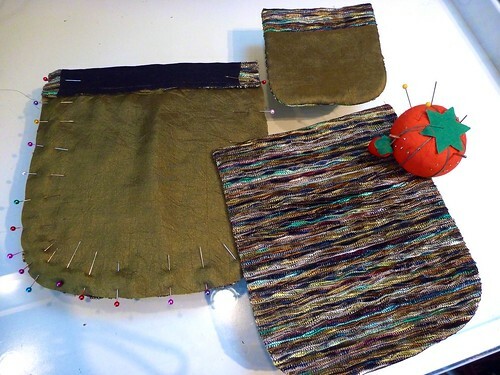 This will also be the last GREEN thing I sew for awhile. Olive is a great color for me, but enough already! This is another one of those situations where, "when great fabric falls at your feet, you should BUY it!" In this case it happened at Metro Textiles in NYC. I've mentioned before that this place is very "hit or miss" for me. Like almost all New York fabric stores it can be overwhelming. There is fabric literally stacked to the ceiling. And what can't be stacked is leaning up against the walls. My eyes glaze over and I go blank the minute I walk in. 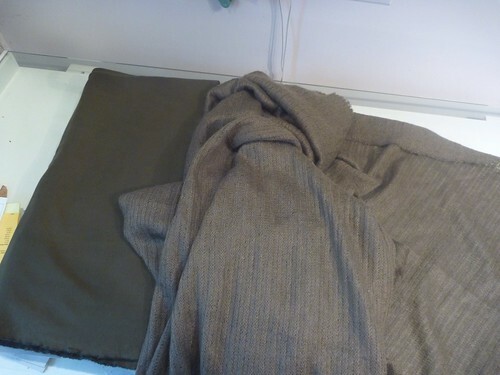 I almost completely overlooked this olive green ribbed sweater knit, which was mixed in with some rolls of wool coating. 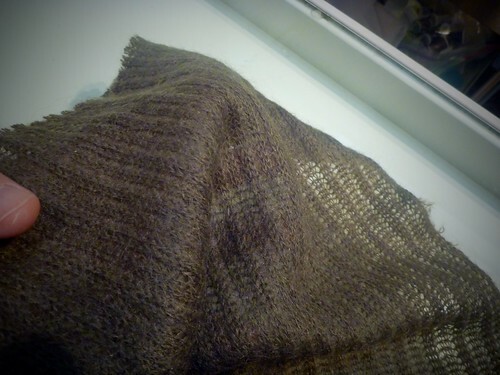 It turned out to be wool / mohair. Incredibly soft. How much? $15 / yd. How could I say no. SOLD! As you can see here it's quite loosely knit. 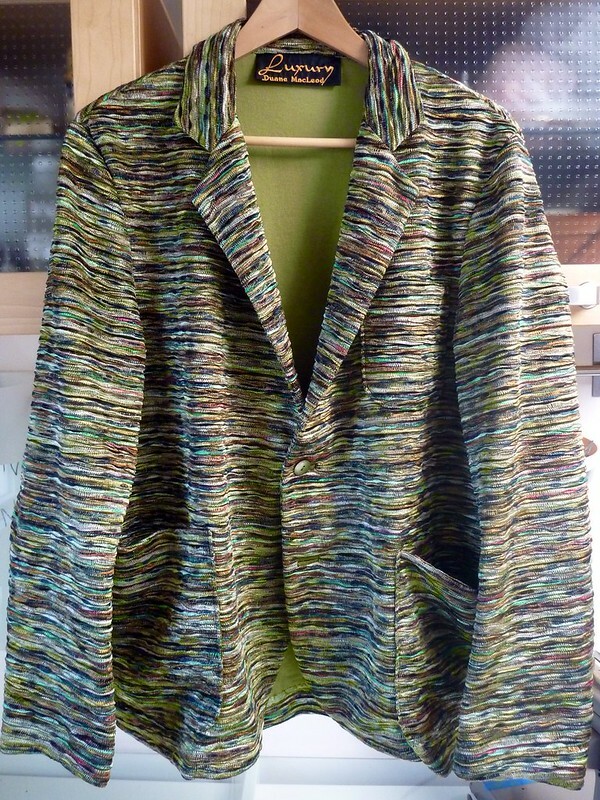 So my plan is to line it with another knit fabric, which I've been doing a lot lately with my "Phoney Missoni" jackets. My search lead me to Elegant Fabrics on W 40th, a big fabric emporium without all the frenzy of Mood. Am I the only one who's entirely unnerved the instant the elevator doors open there? All the commotion, the bag check, ugh. I much prefer being greated by the adorable little Boston terrier at Elegant Fabics, than the bag check guy at Mood! Anyway, I splurged on some gorgeous heavy wool jersey, which totally offset my bargain at Metro. It just seemed wrong to pair a luxury sweater knit with anything less. 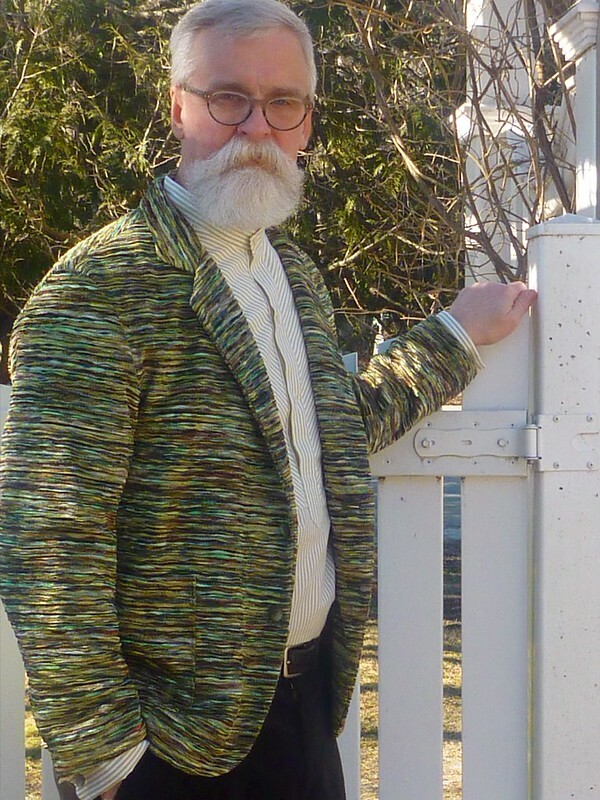 The Finlayson sweater is a classic style, and I anticipate wearing this sweater for years. We all work hard on our projects, so don't we deserve to work with the best materials we can afford? More and more, my answer is "Yes"! This process is becoming very familiar. 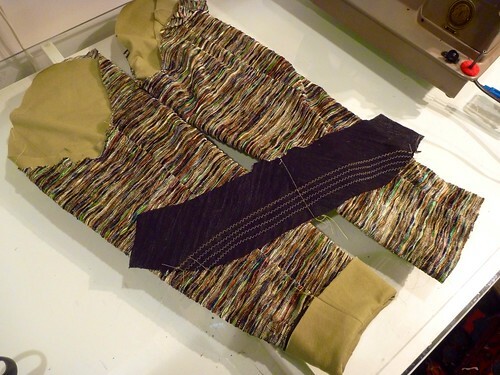 Here the sweater knit and jersey are basted together. 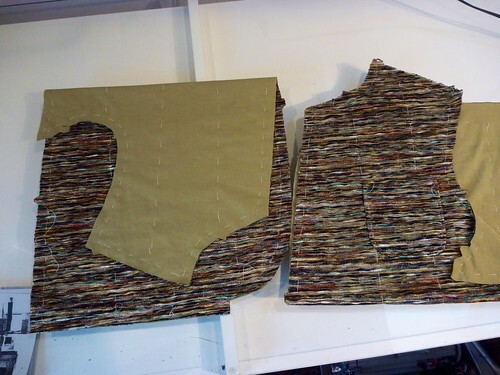 Both fabrics together are quite hefty so I'm going to alter the Finlayson pattern slightly. 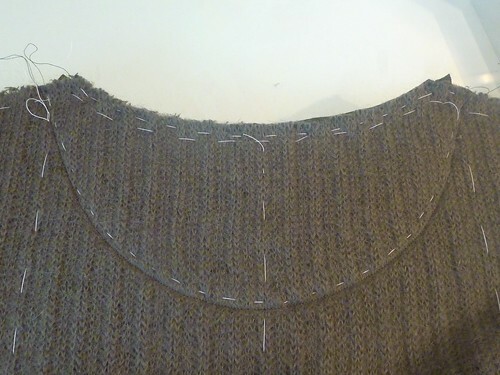 I'm eliminating the cuffs and waistband, a fairly easy fix. 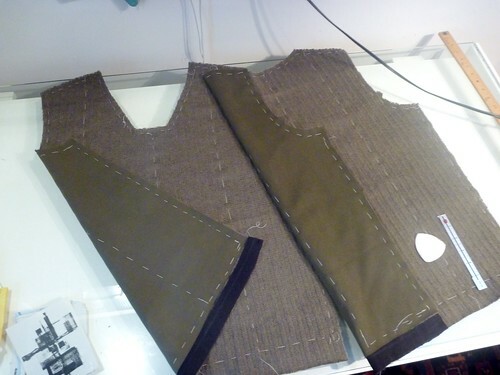 I lengthened and slightly tapered both the sleeves and the fronts and backs. 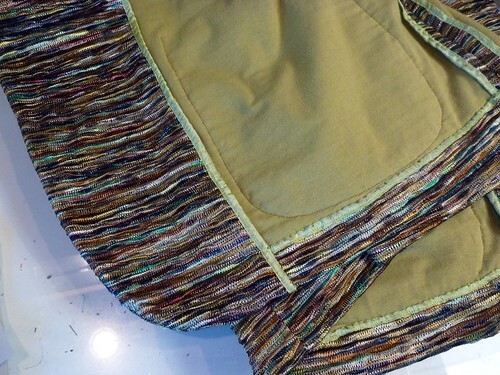 I also fused a strip of Fashion Sewing Supply's Pro Tricot interfacing to the hem. 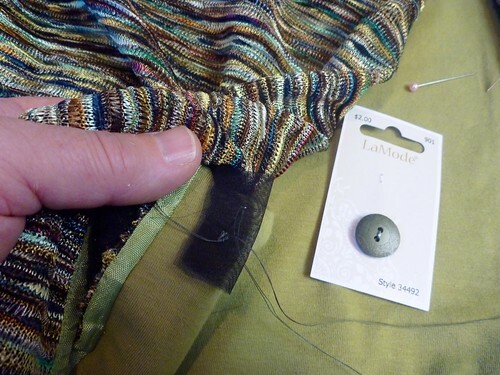 This technique worked well on my Missoni-esque jackets to stabilize the edges of the loosely knit fabric. 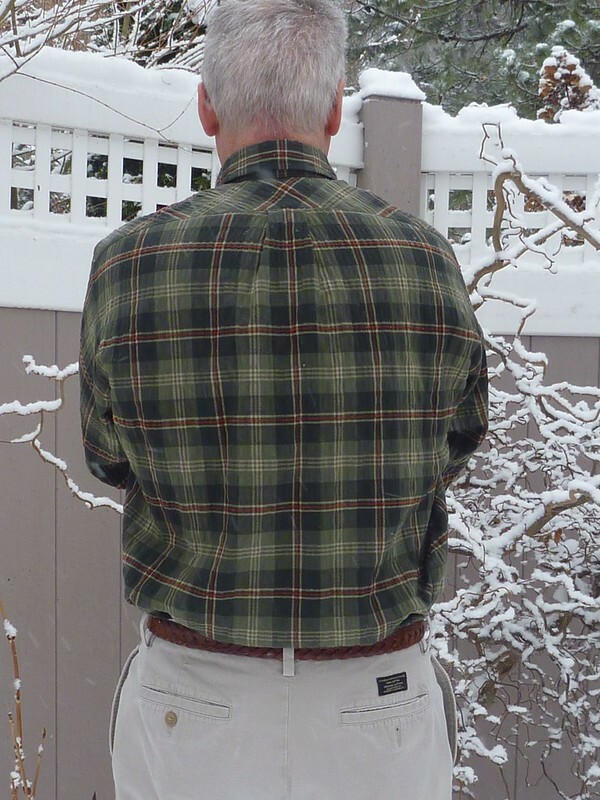 The Finlayson pattern has an optional back facing. 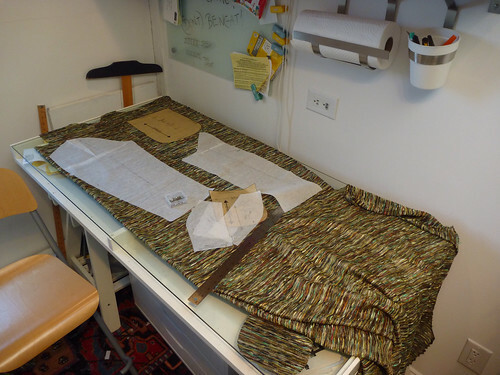 It adds a nice touch and is very easily accomplished with a scrap of fabric (of which I have plenty!). It also gives some "back interest" to the sweater. I'll save putting on the overlapping shawl collar for another day. It's really what "makes" this sweater, so I'll need to be fresh and give it my full attention. It's a done deal. 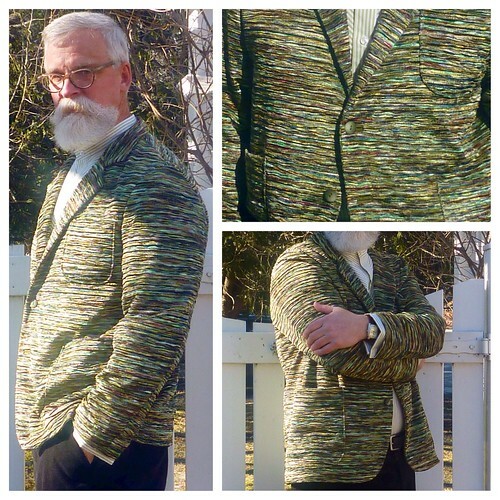 My Missoni knockoff is officially entered over on Pattern Review. You can check it out here. I have to say it was no easy task figuring out how to navigate the PR process on my iPad. After a couple of wrong turns, and what seemed like endless shuffling of my photos back and forth between several apps, I finally got it posted. 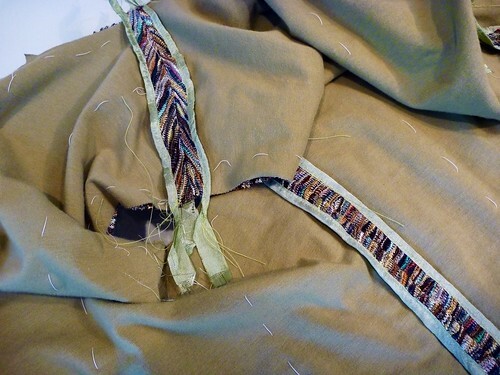 Sewing the jacket was actually the easiest part of the whole process! Still, I have to say it's been great fun. Who knows, I just might enter another contest one of these days. I wasn't lying ....it's very green! 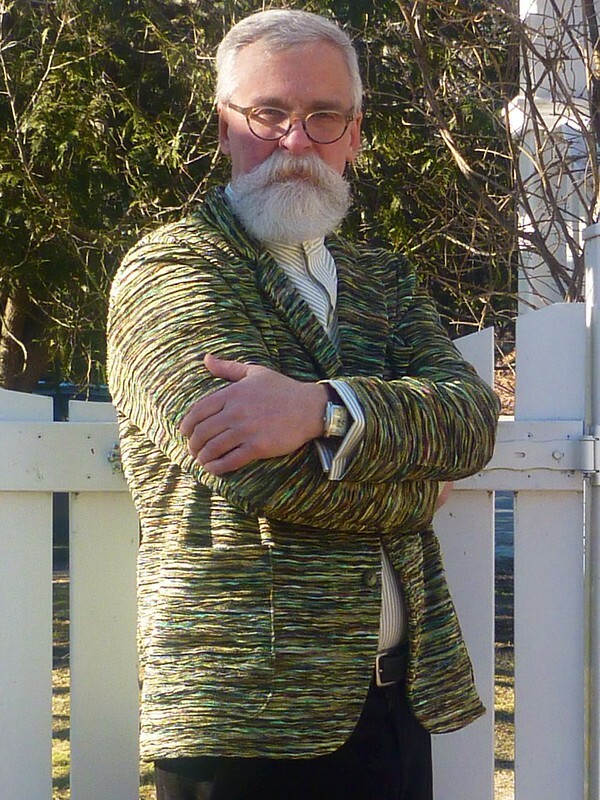 Here I'm wearing the jacket with a version of Folkwear's Victorian Shirt. 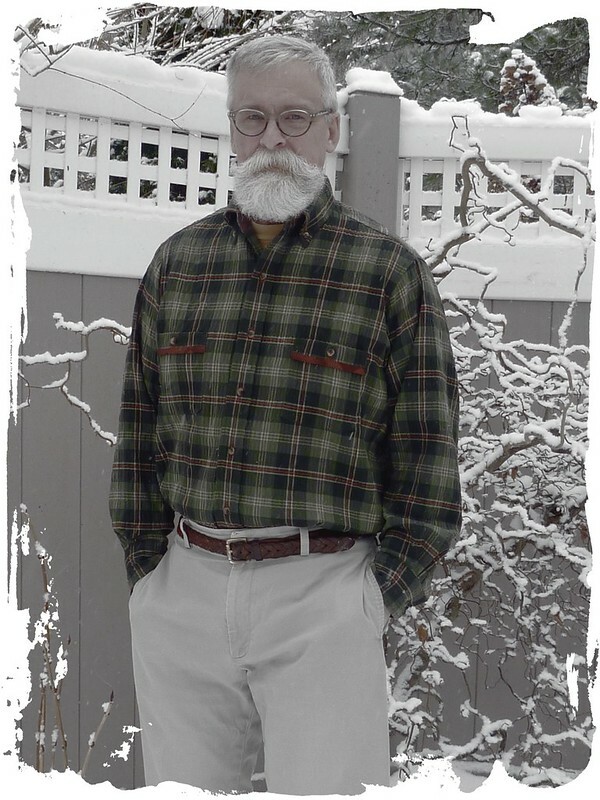 I changed the front placket slightly and added French cuffs. The pants are my dark brown velvet Jeds. I was limited to only 2 pictures for the contest, so I tried out one of the many free photo collage apps. Yay! I figured it out! I'll probably be using it a lot in the future. It's quite fun to play with. 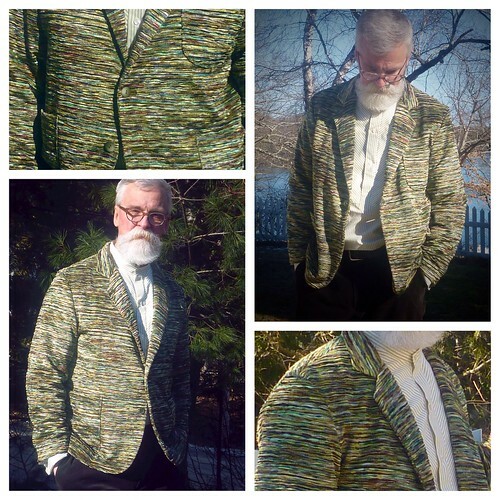 I want to work on one other winter project, a wool / mohair Finlayson sweater, then I'm thinking SPRING! 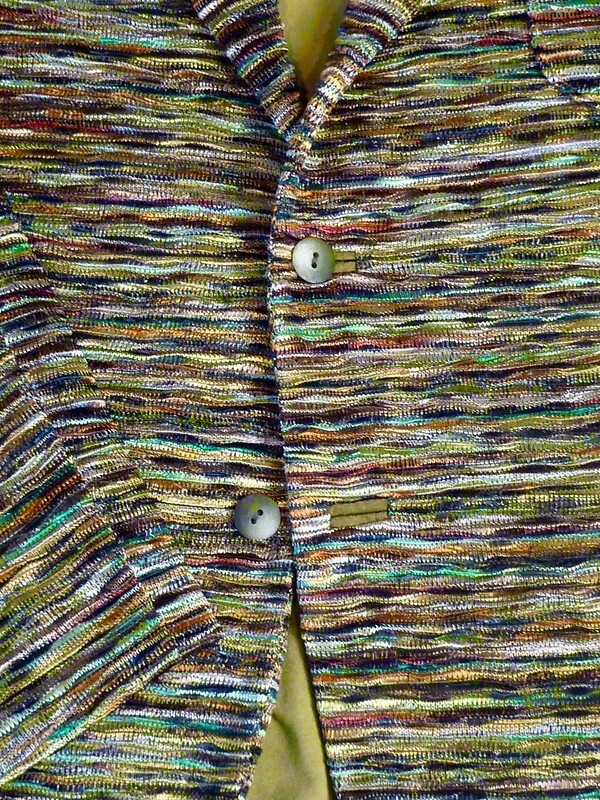 A Junya Watanabe inspired jacket perhaps. As always, thanks so much for your encouragement. Happy sewing! Or ..... When great fabric falls on you, you should BUY it! This fabric actually fell on me in a crazy crowded NYC fabric store. Some of you may know the place. It's the one that's perpetually going out of business and everything is 50% off. Yes, that place. You walk through a path about 1 ft. wide surrounded by islands of ITY knit for $3.99. Anyway, this bolt fell on me as I was trying to make my escape from all the ITY. It was a true, "wait, what's this??" moment. 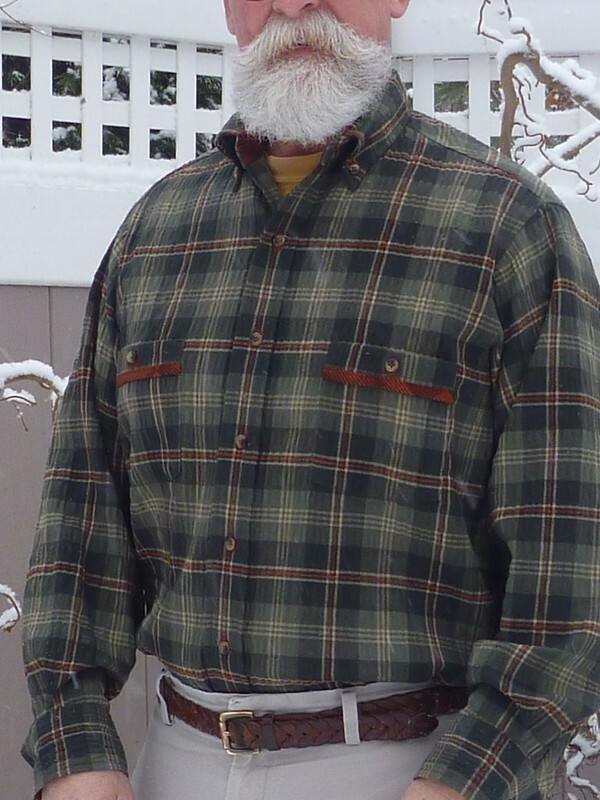 It's a heavyweight cotton twill seersucker. I've never seen anything like it. 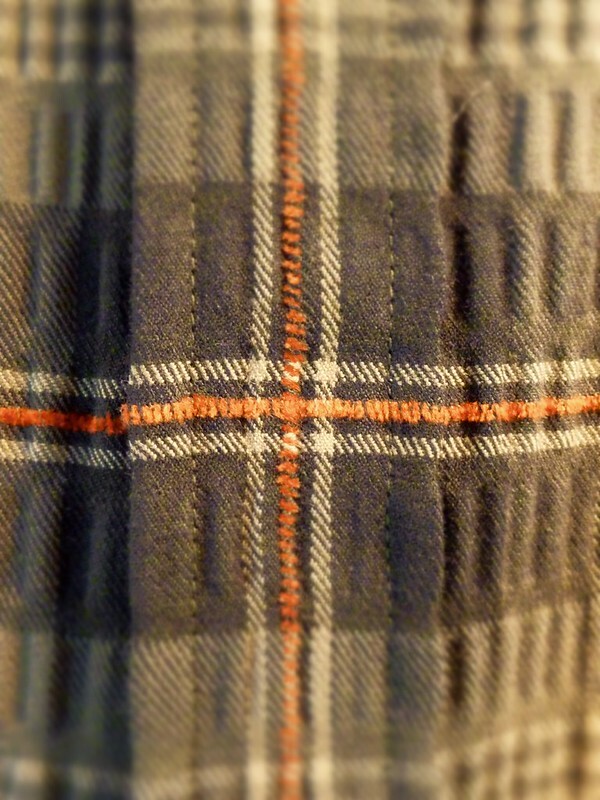 And to make it even more amazing, the rusty orange stripes are actually embroidered onto the fabric. It was fabric love at first sight. The salesman sweetened the deal by dropping the price to $8 / Yd. SOLD! I good washing and drying really brought out the texture. It did make for some challenges, however. 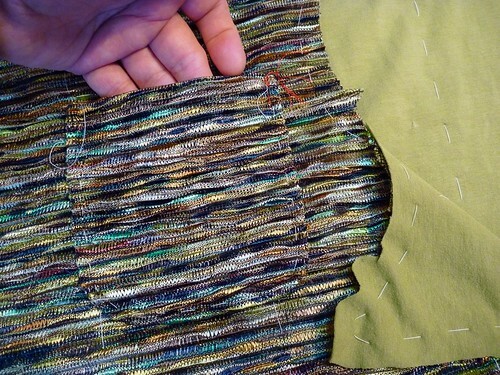 It was virtually impossible to press this fabric in a straight line. Even my buttonholes ended up getting skewed. In the end, none of it is terribly noticeable. I picked up a rusty quilting cotton at a local discount fabric place. 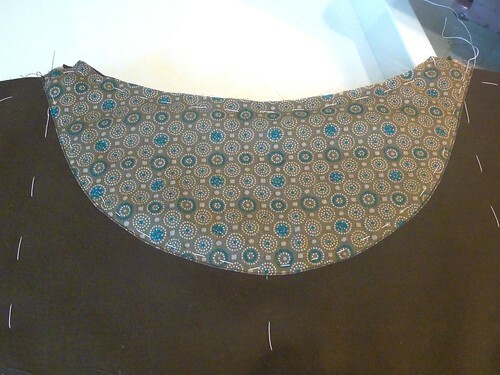 I used it for the inner collar stand, inner yoke and the inner cuffs. 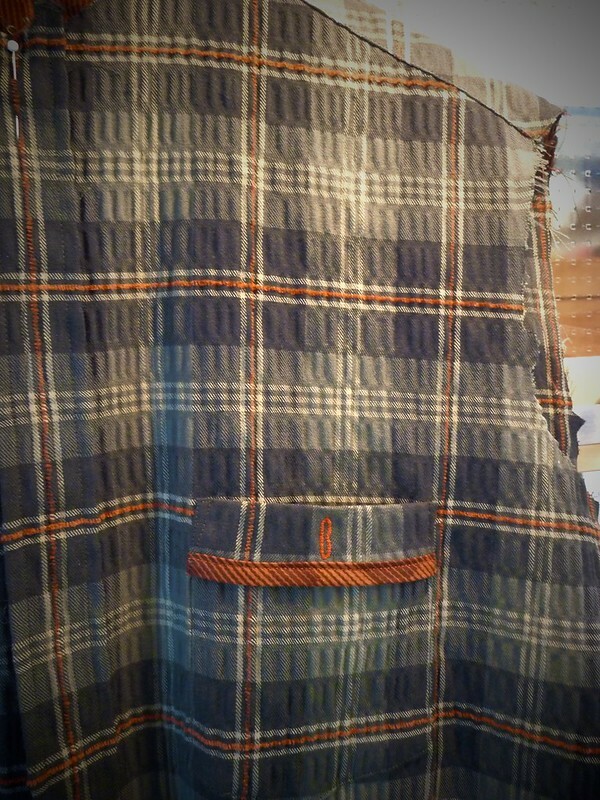 I did something a little different with the pockets by adding a bit of bias binding and turning the pocket top to the outside to create a little flap. 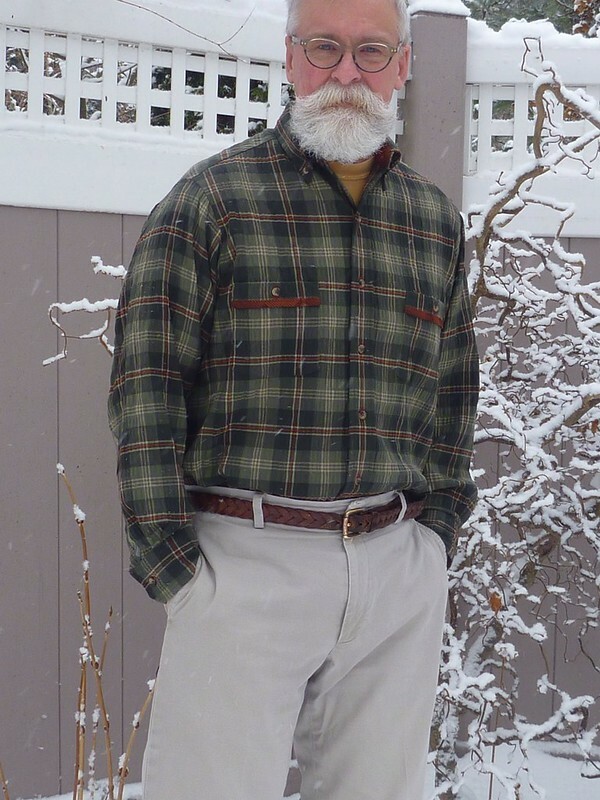 Other than that, it's a basic buttondown. My TNT pattern. It's a little chilly for this! I'm retreating inside for more coffee and then heading off to work on the boat. 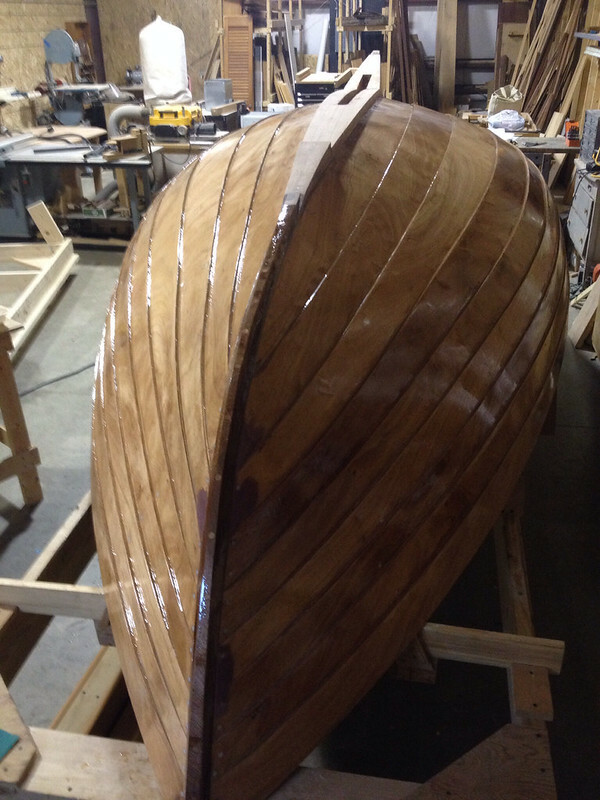 I haven't posted any boat progress lately. 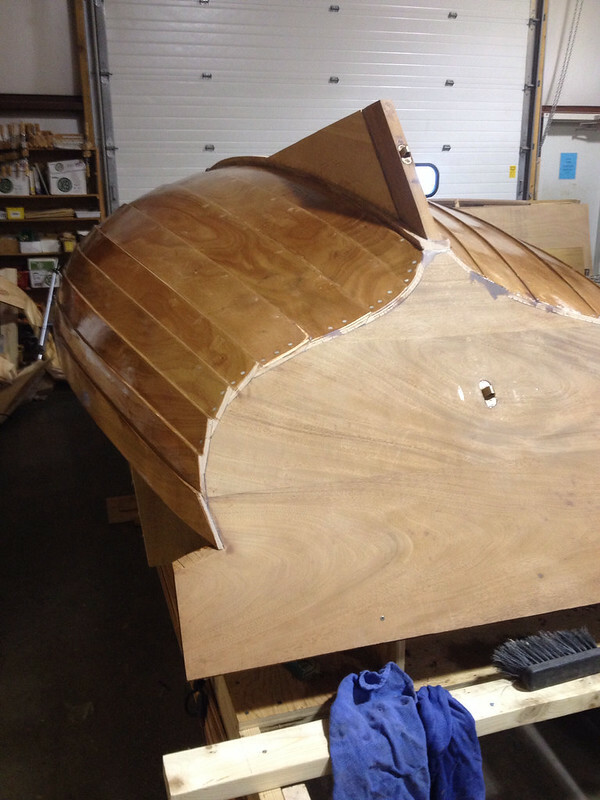 I'm currently sealing the hull with an epoxy clearcoat. The shop hovers around 50 degrees, so it's taking about 3 days for the epoxy to cure. I hope all your winter projects, whatever they might be, are going well! I should have my head examined! I've gone and entered my first sewing contest at Pattern Review. I've looked at these contests before, but they always strike me as impossible. One Pattern -- Many Looks. Oh, man, I'd be lucky to complete ONE look! Or something like, A Complete Coordinated Wardrobe. Seriously? Anyway, I've decided to enter this designer knockoff challenge. 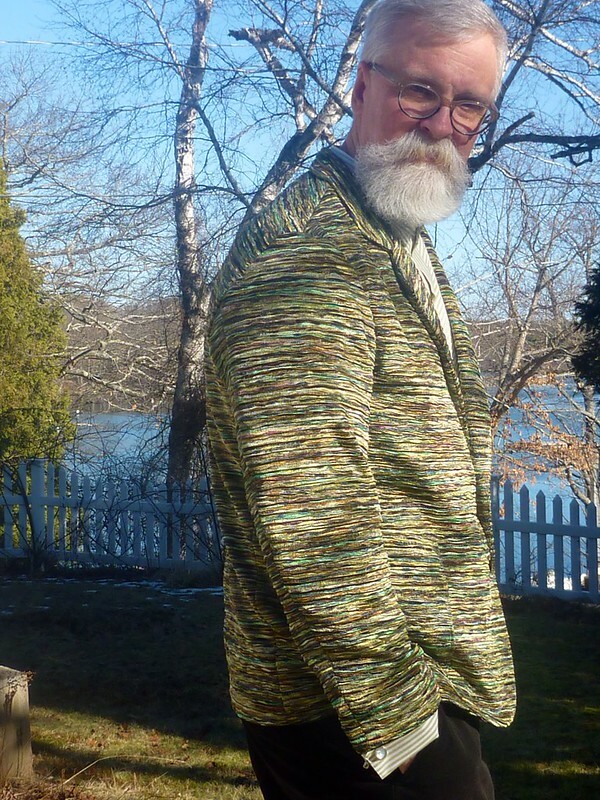 I have the materials to make another "Phoney Missoni" jacket, and I figure this contest will be the push I need to get it made. Hopefully, I can complete it before the end of the month. Speedy I'm NOT! BTW the grand prize is a new ironing board cover! Better get cutting! Dad needs that cover badly.